Can't attend? Follow Tortoise / Tortoise General Store / Tortoise Hasami Porcelain Store (Mar Vista) to know of future events! 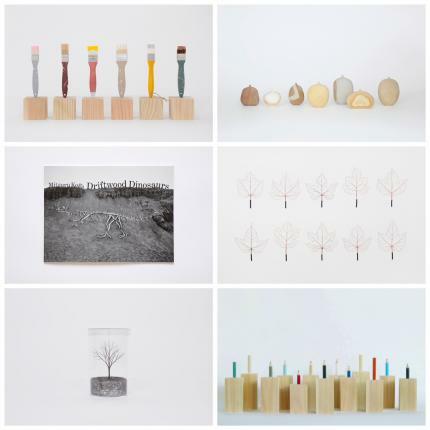 Since 2008, Tortoise has had the honor of exhibiting several different works by contemporary Japanese artist, Mitsuru Koga including Koga's well known wire trees, wire leaves, sea-stone vases, leaf cutouts and statues of color pencils and brushes. Koga's most recent works, entitled 'Flatworks', is an exploration of the ordinary things through an extra-ordinary eye. With great skill and mysterious methods, Mitsuru Koga shows us a colorful world in which we can marvel at tools and objects with renewed appreciation. Whether it's observing paintbrushes or paint cans, the artist gives vibrancy to these still life objects found in his atelier by making them into two-dimensional forms using the object's exact original materials. Please join us next week in celebrating the artist Mitsuru Koga by attending our special reception for the artist, August 23rd Thursday from 5:00 pm to 8:00 pm. The exhibition entitled 'Flatworks: Paint Cans + Boxes' will be a month long installment at Tortoise from August 24th, Friday to September 23rd, Tuesday, and will be open to public viewing and purchase during our business hours: Tuesday - Saturday 10:00 am - 6:00 pm and Sunday 12:00 pm - 5:00 pm. We will serve light refreshments at the reception, and the artist himself will be doing a special 1 hour book signing of his photo-book "Driftwood Dinosaurs" from 6:00 pm to 7:00 pm during the evening's reception. For those who can't make it to the reception party, Mitsuru Koga will be at Tortoise with his 'Flatworks' pieces the following Friday and Saturday during our business hours, 10:00 am to 6:00 pm, August 24th and August 25th. RSVP is not required, but strongly preferred. This is a free and fun event - we hope you can join us!